An intensive three-day workshop provided by the Hannaher’s Print Studio, Print Manager Amanda Heidt, and artist in residence, Jason Moore will be made available to the public. 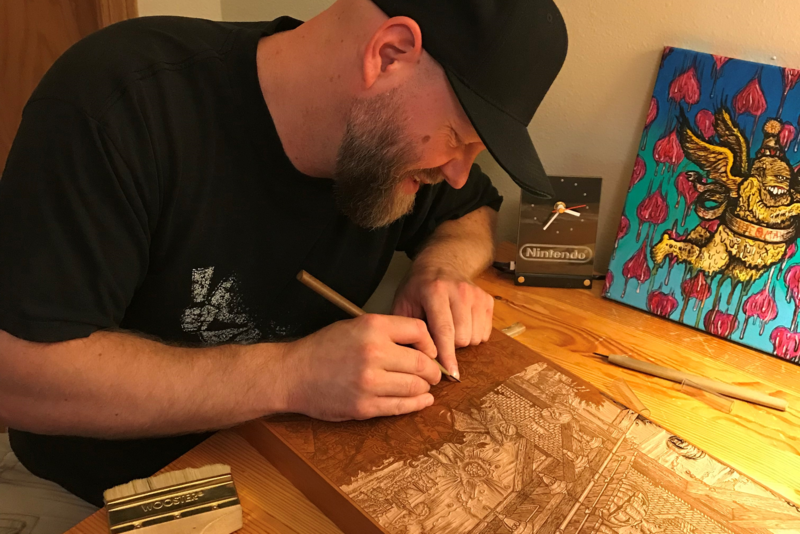 Participants will be introduced to the art of traditional woodcut printmaking, and they will design, cut, and print their own edition of fine art woodcut prints. In addition, each participant will take part in a portfolio exchange of each other’s work, and they will receive a woodcut print developed by Jason Moore specifically for this exchange. Jason Moore is a well-known and highly regarded artist and printmaker based in the Fargo area. His highly detailed, surreal narratives have developed over decades of commitment which started in 1996 through courses provided at North Dakota State University (NDSU). Moore received his BS in Art at NDSU in 2000, and his MFA in printmaking at the University of Iowa in 2005. He is currently teaching environmental design drawing as a part time lecturer at NDSU. Jason is the 2018 Artist in Residence in the Hannaher Print Studio at Plains Art Museum.